I have fond memories of hiking and backpacking in Rocky Knob Recreation Area. My sons and I camped in the well shaded primitive campground in the gorge next to Rock Castle Creek. We used it as a base camp for the loop hike up to the top and then back down again. My daughters and I hiked the half mile into the campground and stayed there for a night or two at a time. We loved camping next to the creek; waking up to the sound of rushing water is very refreshing. The campground is very peaceful. The times we were there we had the place to ourselves. Up top along the Blue Ridge Parkway, you'll see breathtaking long range views from many vantage points. The trails up top are easy as long as you don't venture too far down into the gorge. There is a car campground and a Visitor Center. If you search a little bit, you can find an old Appalachian Trail shelter. (It seems the original AT went from Fancy Gap through here and down through Roanoke east of the current trail.) There are several overlooks with stunning views in the area if you're more interested in car or motorcycle touring instead of hiking. 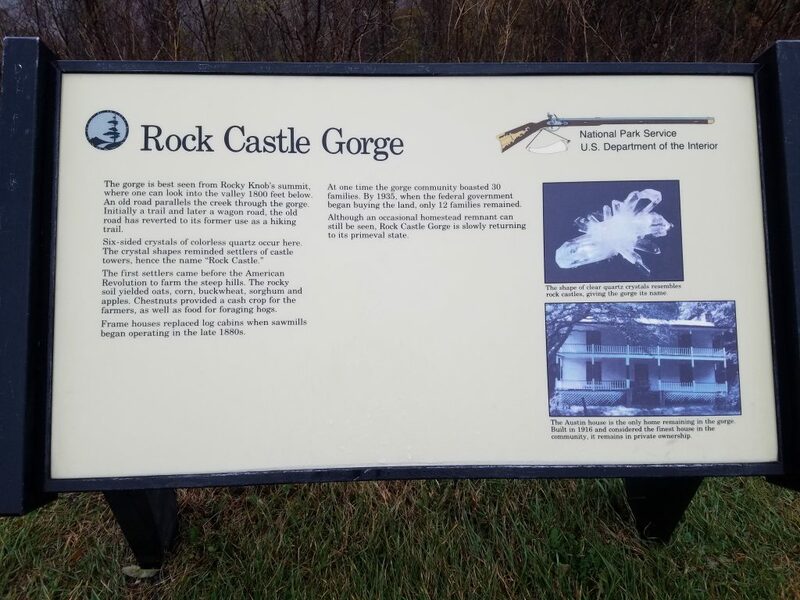 The recreation area is located at mile marker 167.5 on the Blue Ridge Parkway. Down below in the gorge, there is a 2 mile trail along the creek which passes by the Austin House, an old homestead built in 1916. As mentioned, the primitive campground adjoins the creek. Campground permits are available at the Visitor Center and Rocky Knob Campground. To get to the primitive campground, turn south from the Parkway onto SR 8 and follow 3.6 miles to Rt. 605/C.C. Camp Lane. Turn right on Rt. 605/C.C. Camp Lane for 0.7 miles to parking area and trail-head. The loop trail is a strenuous 10.5 mile hike. If you start at the primitive campground (recommended), you can take a clockwise route along the creek for a couple miles and then head to the top of the mountain or take a counterclockwise route that provides a more direct route to the top. Recent reports as of March 2019 indicate the trail to have a lot of downed trees; it might be a good idea to check in at the Visitor Center to check on the current condition of the trail. Highlights include the walk along the creek, the Austin homestead and still-standing chimneys, the only remains of the once-thriving community of mountain folk that once populated the gorge. Though it might look today as if the gorge was never populated, it was once home to 30 families. Folks farmed, ran grist mills, milled lumber and even ran a pre-Prohibition distillery. Although most signs of the history of the community are gone, some still remain -- an old farmhouse, a chimney where a cabin once stood, a Depression-era campground. Their lives have been chronicled in the book, Life in Rock Castle, Virginia in Their Own Words. The book may be found at Floyd Country Market and Poor Farmer's Market in Meadows of Dan. It may also be found in the "library" in the loft at Pilot's Perch Cabin.